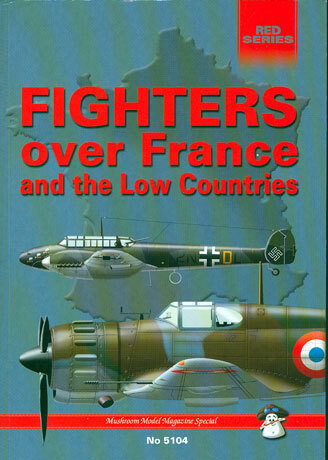 Mushroom Model Publication's latest book is "Fighters over France and the Low Countries". The book is a little different to other titles in the series as each chapter is written by a different expert in the particular country being covered. Although the Battle of Britain, the American and British bomber campaigns and the Defence of the Reich, plus the Eastern and North African fronts are well covered, the earliest European campaigns in Poland, Scandinavia, the Low Countries, and the Balkans have received less attention from authors and modellers. It is pleasing to see the subject of the air war over France and the Low Countries as the focus of this Mushroom Model Magazine Special. The book comprises 152 pages in 9.5" x 6.5" format, with soft covers and including a twenty page colour profile section and a further four pages of excellent colour wartime photos. Countries discussed in this book include Great Britain, France, Germany, Netherlands, Belgium and even Polish and Czech fighters in France. Each country's section is generously illustrated with photographs. The text follows a common format - mainly discussing operations, with a summary of victories and losses for each combatant. Camouflage is not really covered, apart from the colour profiles, presumably due to the massive scope considering the number of Air Forces and aircraft types. As with other books in this series, my only criticism is that the book's format dictates that some of the photographs are quite small, but there are less of these small photos than in earlier titles. The twenty page colour profile section includes 51 illustrations of MB 152, C 714, MS 406, D.520, Bf 109E, Bf 110, FK.58, Hawk 75, Gladiator, Hurricane and Fokker D. XXI. It is nice to see some full-page side profiles, and other subjects being depicted in four-views. 9 wartime photographs are included in the colour section. These are a great and rare glimpse at the actual colours used in the early period of WWII. This book is a succinct and useful resource for the aircraft modeller or the aircraft historian. All Mushroom Model Publications books are available direct from the publishers, who now DO accept credit cards (Visa, MC, Amex, Switch)! North American distributors are Squadron/MMD, Australian distributors are Platypus Publications. In Europe, the books are available from any good bookshop (via our UK distributors, Orca). Contact MMP direct in case of difficulties.